The nation's partial government shutdown is proving more than a financial and emotional burden for throngs of unpaid federal workers; it's also sowing confusion within the agencies, with questions popping up about what travel is restricted, who's supposed to be working and who isn't. With the partial shutdown now in its third week, agencies in the crosshairs of a funding battle between President Trump and congressional Democrats are scrambling to digest what the shutdown means for staff. At the Energy Department, officials in at least one office sent an email to staff Monday afternoon directing them to halt all travel scheduled through the end of February. Within days, the same guidance was reversed. A document obtained by E&E News from DOE officials directed all federal employees, fellows and contractors within the Office of Energy Efficiency and Renewable Energy to cancel travel for the next two months. Some workers at the Advanced Research Projects Agency-Energy reported similar guidance because of the government shutdown. Privately, staffers not authorized to speak to the press said they were frustrated and had been told verbally not to attend events planned for weeks or months. "It's crazy," said one staffer. The confusion at DOE, in particular, has been surprising since the agency has money appropriated through this fiscal year. That isn't the case for EPA and the Interior Department. A spending package last March increased funding for most DOE offices, despite Trump administration proposals to eliminate programs like ARPA-E (Greenwire, March 22, 2018). The email from DOE officials to staff cited "optics" around the shutdown as the reason for new travel guidance. But when asked this week about curtailed travel, DOE spokeswoman Shaylyn Hynes said agency leaders hadn't imposed a two-month travel ban. "That information is false," she said. A source close to the White House said the president has not directed agencies to halt all travel. DOE staff received updated guidance Tuesday clarifying there were no travel restrictions. The uncertainty is cropping up in different ways across the federal footprint, but some of the day-to-day hiccups for government workers in small offices stem from miscommunication by top managers and the unraveling of larger bureaucracies. Sue Parton, president of the Federation of Indian Service Employees, said crime rates have increased on land managed by Interior's Bureau of Indian Affairs since the start of the shutdown. But she said the agency's law enforcement personnel have had trouble getting travel vouchers for gas mileage and lodging because the employees who process the requests are furloughed. And there's confusion at Interior's Bureau of Indian Education about who is supposed to be working and who isn't, she said. "They are really confused about the criteria," Parton said. "The agencies we represent deal directly with human beings." That's different, she noted, than the mission of some of the other bureaus at Interior, which deal primarily with land. Others say it's been smooth sailing. 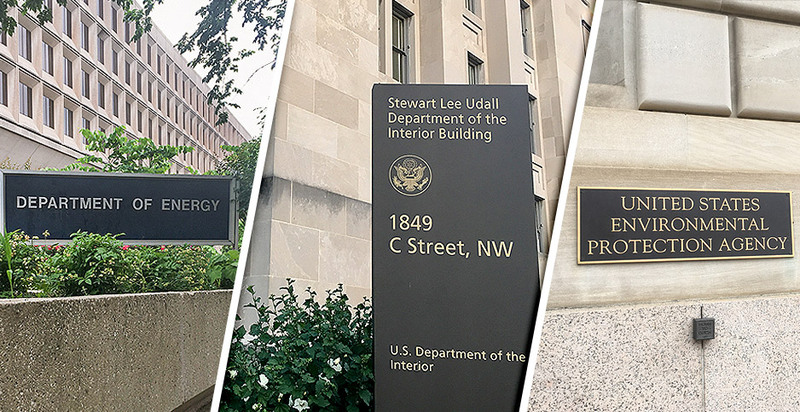 Steve Hardgrove, chief of staff for the Interior Department's inspector general, said the White House directive has not been confusing for people inside the small IG's office. The office runs on one-year funding, and it's been almost entirely shut down, except for a small handful of agents assisting prosecutors on upcoming trials. The shutdown will affect the IG's work, Hardgrove said. The office receives an average of 20 complaints a day that need to be investigated, and those continue piling up. Transportation Secretary Elaine Chao canceled her trip to the Consumer Electronics Show, or CES, in Las Vegas this month, skipping one of the largest technology conferences in the country. Still, some top members of the administration are gearing up for the influential World Economic Forum in Davos, Switzerland, later this month. Trump won't be among them. The president said in a tweet today that he is canceling his trip. "My warmest regards and apologies to the @WEF!" he tweeted. Canceled travel plans to winter conferences across the country have been a core complaint of government workers. For example, the American Meteorological Society conference is happening this week in Phoenix, "and all of NOAA is not there," according to Mark Pellerito, a branch steward of the National Weather Service Employees Organization, which represents workers at NWS. That includes NOAA officials in Arizona, who are restricted to working on essential functions, he said. Hundreds of officials from across the country typically attend the conference. "We're missing out on the biggest transfer of information from research to operations, which leads to better warnings and better forecasts," Pellerito said today along the sidelines of a union-led shutdown protest near the White House. An email to NOAA press staff asking about the agency's absence from the conference received a bounce-back message saying, "Due to the federal government shutdown, I am unable to access e-mails or telephone voicemails. I will respond to your message in a timely manner once funds have been appropriated and the shutdown ends." The National Science Foundation helps manage the Scholarship for Service program, which recruits and trains cybersecurity experts to serve in federal, state and local government roles. This week was the program's job fair, which is a hub for some of that recruitment. Because of the shutdown, some NSF officials didn't show, according to an email obtained by E&E News that was sent to staff Monday. Victor Piotrowski, an official with the science agency, said Department of Homeland Security officials who have been affected by the shutdown couldn't attend the fair, either. "It is really sad that several folks from NSF and DHS are not able to attend the Job Fair after working on this event for almost 6 months," said Piotrowski in the email. "We hope that you will enjoy and that your students will get multiple offers!" Emailed at his NSF address asking whether he wanted to comment, Piotrowski's account sent a bounce-back message. "Due to a lapse in government funding, most National Science Foundation staff will not be receiving or responding to email until further notice," it said. DHS has called off all "non-mission critical travel," per its shutdown guidance, disrupting plans for some exempted employees to attend a critical infrastructure cybersecurity conference in Miami next week. Cybersecurity specialists at the agency are keeping round-the-clock analysis centers staffed, and the agency's Hunt and Incident Response Team has stayed online throughout the funding lapse. That office is responsible for offering on-the-ground assistance to parry online threats to U.S. critical infrastructure like the power grid or manufacturing plants. Still, nearly half the employees at DHS's new Cybersecurity and Infrastructure Security Agency are furloughed. "I don't think anybody could honestly say, 'Oh, don't worry, this is not having an impact,'" said cybersecurity consultant Tina Ayiotis. "If there's a [cyber] event today that's huge, I don't know how coordination would happen." EPA has also slashed travel. The agency said official trips have been suspended with a few exceptions, according to its shutdown plan. When announcing the agency would close almost two weeks ago, acting Administrator Andrew Wheeler said staff who weren't working would have to cancel travel plans. "All travel is cancelled for furloughed employees," he said in a Dec. 27 email to employees. That travel ban has begun to have an impact at EPA. One union official said training this week for EPA's on-scene coordinators — officials responsible for handling the agency's emergency response to oil spills and releases of other hazardous substances — was no longer on the schedule. "Our annual on-scene coordinator training scheduled for EPA Region 5 for this week was canceled," said Mike Mikulka, president of American Federation of Government Employees Local 704, which represents EPA staff in the agency's Chicago office. "All OSCs from around the region were coming in for that." Others said community outreach by EPA has fallen off during the shutdown. There's expectation that the agency's inspections will suffer, too. "Well, at least in my section, I know we have had to postpone or cancel at least one community meeting in Arkansas concerning enforcement actions, and another planned inspection is going to be postponed or canceled depending on how long this shutdown goes for," said Justin Chen, a member of AFGE Local 1003, which represents EPA Region 6 employees. It's also going to be tough to reschedule considering several managers have been sent home along with their subordinates. "We haven't received any direction on rescheduling as management has been furloughed as well," Chen said. EPA press officials didn't respond to questions from E&E News, including on whether Wheeler had canceled any of his official travel during the shutdown. Past funding lapses have hampered EPA administrators' travel. Wheeler's predecessor, Scott Pruitt, canceled a trip to Japan in January 2018 in the midst of a government shutdown then (Climatewire, Jan. 22, 2018). Reporters Hannah Northey, Christa Marshall, Joel Kirkland, Blake Sobczak, Kelsey Brugger, Kevin Bogardus and Corbin Hiar contributed.